A lunar eclipse occurs when the moon passes through Earth's shadow. During a partial eclipse only part of the moon is covered in our shadow because the moon's orbit is not the exact same path as our Earth's. A total eclipse, where the Earth's shadow blocks the moon entirely, is less common. In this photo, the moon glows a brilliant red in this skywatching photo taken by astrophotographer Dec. 10 total lunar eclipse in the Zagros Mountains of Iran. The event marked the last of five eclipses to occur in 2011. This eclipse was visible in most of Asia, Australia and areas of the Pacific. Lunar eclipses are safe to view without eye protection because the light from a lunar eclipse is no brighter than that of a full moon — unlike a solar eclipse where the brightness can still damage the eyes even if the sun is hidden. 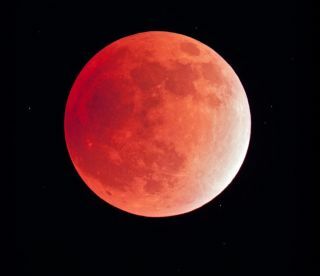 This moon glows red, but eclipses can often be brown, orange or so dark they can't be seen. The moon looks red to us because sunlight filters through the Earth's atmosphere onto the moon. The reddish color is created by dust and clouds in the Earth's atmosphere. In some cases, if there is enough dust in the Earth’s atmosphere, the eclipsed moon is hard to see. This occurred right after the eruption of Mount Pinatubo in the Philippines in December 1992.